ScreenLine Venetian Blind kit with slide control located on the right or left hand side of the insulated glass sealed unit. This blind is available for 20mm or 22mm airspace and comes with the blind cartridge, spacer bar, corner keys and control system (including surface control guide) for insulated glass sealed unit manufacturers to encapsulate within a sealed unit. We recommend that units incorporating ScreenLine Blind Systems are gas filled. Blinds are made to bespoke sizes and colours. Check feasibility and availability on ordering. S System ScreenLine Venetian blinds are supplied as a kit as detailed. 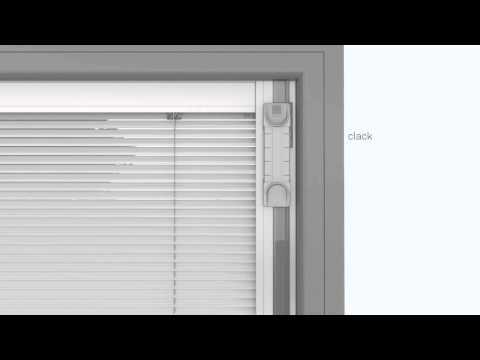 ScreenLine blinds have various patents on the blind systems including magnetic drive systems. External magnet controls are coupled with an internal magnet drive which allows controls to work with insulated glass sealed units without compromising the integrity of the unit. Manufacturing Guides and Technical Data can be downloaded below or supplied on request.